The Wife of Bath is one of the texts that I read for my A2 coursework. 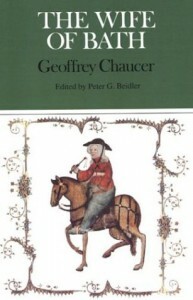 Part of Chaucer's 'The Canterbury Tales', The Wife has the largest Prologue to her tale, and is perhaps one of the most colourful characters in the Tales.The Wife has been married five times and is keen to put forward the idea that female experience is more important than written male authority when it comes to the experience of marriage. The Wife neatly criticises authorities from the Bible and other early texts, in addition to putting forward her own life story as a way to prove that women know more about marriage than men do.She does occasionally shoot herself in the foot; her actions often come across as cruel, and her choice of language is often crude and base. This leads to a critical debate about whether Chaucer supports the Wife's demands for female character, or whether he makes her a laughing stock. The Wife is a well formed, bright, very 3D character, who almost leaps from the page. However, it is in no way an easy read due to the archaic language; I'm not sure whether I would like to read the other Tales in my own time.